Not all businesses should do content marketing the same way. To help give your company some direction, we're publishing a series of articles about different content marketing strategies, and how to know which one to use. This is our third installment in the series. They work—we’ve used them to help our clients and ourselves grow the number of organic visits, leads, and customers. In this article, we’ll talk about how to grow your visits using content if you currently have more than 25,000 organic visitors per month. You have great success getting people to your site organically, meaning you get at least 25,000 organic visitors per month (or in that general ballpark). You have a domain authority of 50+. This means you have several blog posts bringing in 1,000+ visits per month, and you’re ranking for competitive topics related to your industry. You have aggressive growth goals. You need to grow sales opportunities in the pipeline. It’s Time For Sales Growth. 1. Write about topics that are attracting your most highly qualified leads. At this stage, you are getting enough visits and leads to go a deeper level into strategies for creating content. Now, it’s less about which topics bring in leads, and more about which topics bring in specific types of leads, sales qualified leads, customers, etc. Post X brings in 1,000 visits, 50 leads—5 of which are sales qualified leads. Post Y brings in 1,000 visits, 50 leads, and 12 are sales qualified leads. If you can prove over a period of time that Post Y brings in more sales qualified leads than Post X, you will want to write more posts like Y. 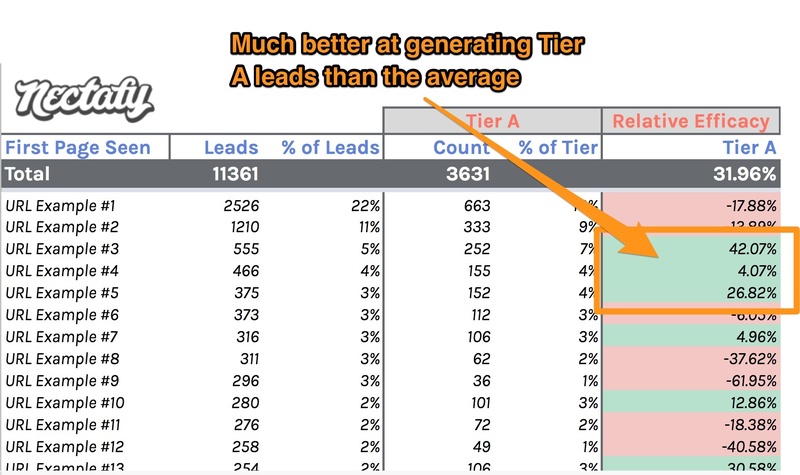 For example, one of your blog posts intended for top-of-funnel contacts may be bringing in highly qualified (Tier A) leads. If this is the case, you’ll want to write more about that particular topic, since it’s clearly attracting the type of leads you want. 2. Monitor the conversion rates on posts and pages to make sure they have the most appropriate CTAs. If you’re getting thousands of visitors but not a lot of leads (less than 1%, for example), you may not have the right CTA. This tactic will help you see if that’s happening on your pages. For example, this post gets a phenomenal amount of traffic—roughly 30,000 views every month. When the article above was originally published, it only had one call-to-action (CTA) at the end of the article. As the traffic began to grow rapidly, we revisited our strategy and added relevant links as CTAs throughout the article. 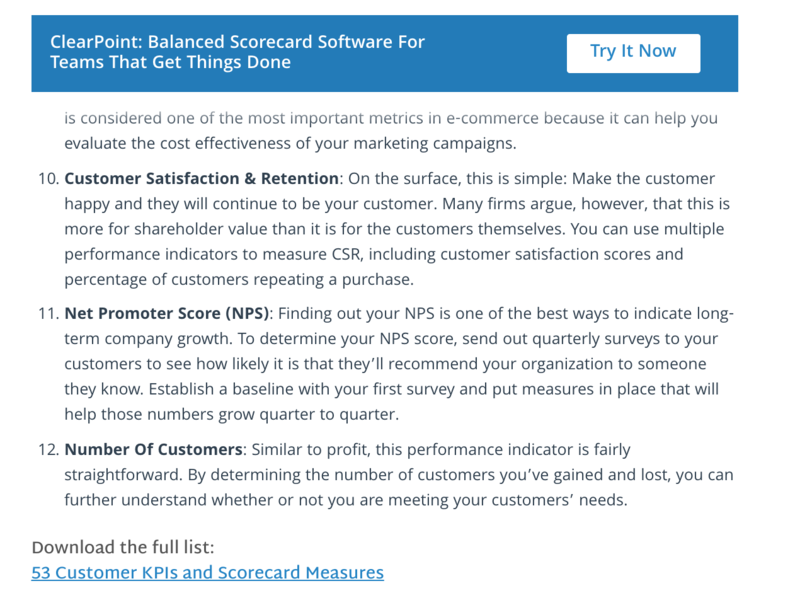 For example, in the image above, you can see that the three people-related metrics are followed by a link to “Download the full list” of 53 HR KPIs and measures. This action nearly doubled the number of visitors who became leads, taking the conversion rate from 1.5% to 2.5%. With 30,000 visits per month, that means we continue to add an additional 300 new leads to ClearPoint’s database each month—and we were able to do this just by revisiting CTA placement within the article. Look at your high-traffic articles. Examine the conversion rate for each post. For the most-visited yet lowest converting articles, find opportunities to test out new CTAs to see if they’ll bring in more leads. Switch in new CTAs at the bottom of the post. Add more value to the article by linking to offers throughout the article text (as shown in the example above). Track the conversion rate over time (before and after making CTA changes); you will likely be pleasantly surprised with the results! 3. Write offers that fit the keywords you’re currently ranking for. When potential customers are visiting your website but leave without converting, examine your current offers to make sure you have a natural way for them to convert. 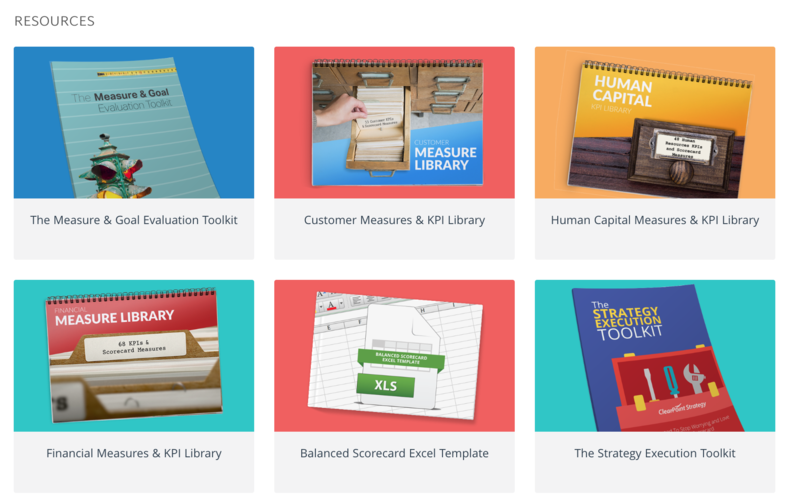 To create an avenue for ClearPoint’s interested audience to become potential customers, we created KPI libraries for every department of a business. These libraries served as a targeted offer appropriate for the client’s high-performing blog posts that didn’t otherwise have an offer matching the content. If your site is ranking for topics, for example, that interest sales managers but you aren’t getting many leads from these topics, readers are probably coming to your site and not finding a way to convert. Do you have a sales manager-specific offer that would appeal to them—answering questions, providing “insider tips,” addressing challenges, or giving them a useful template? If not, create one! For any post or page that gets thousands of views and ranks highly, brainstorm ways you can create offers (eBooks, guides, templates, scripts, “how to” manuals, etc.) that would pair well. 4. Create blog posts specifically for your existing offers. Your LPs are most likely only a couple hundred words at most, but they’re probably not ranking in Google. For any offers you’ve already created, use the keywords within the offers and create introductory articles to those offers using those keywords. Roughly 1,500 people visit this article each month, which was written specifically as an introduction to the offer in the CTA. 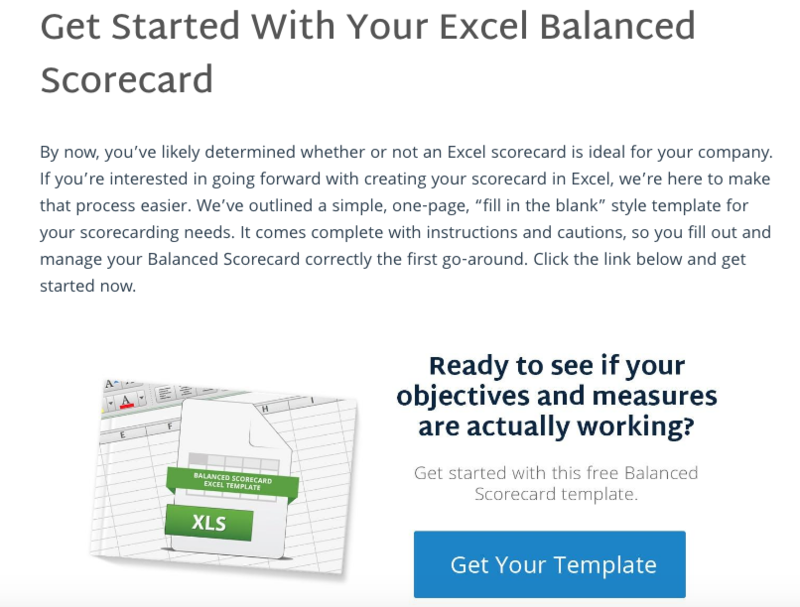 It describes how to create a Balanced Scorecard (a strategic framework) in Excel—and then offers a free template to create a Balanced Scorecard in Excel. It doesn’t get much more closely matched than that! Write introductory posts for any new offers you create, as well as any existing offers that don’t already have an introductory post. Be sure not to divulge everything your offer discusses; you want to create interest in downloading the offer, not give the whole thing away! 5. Rewrite articles to include a bottom-of-funnel landing page. 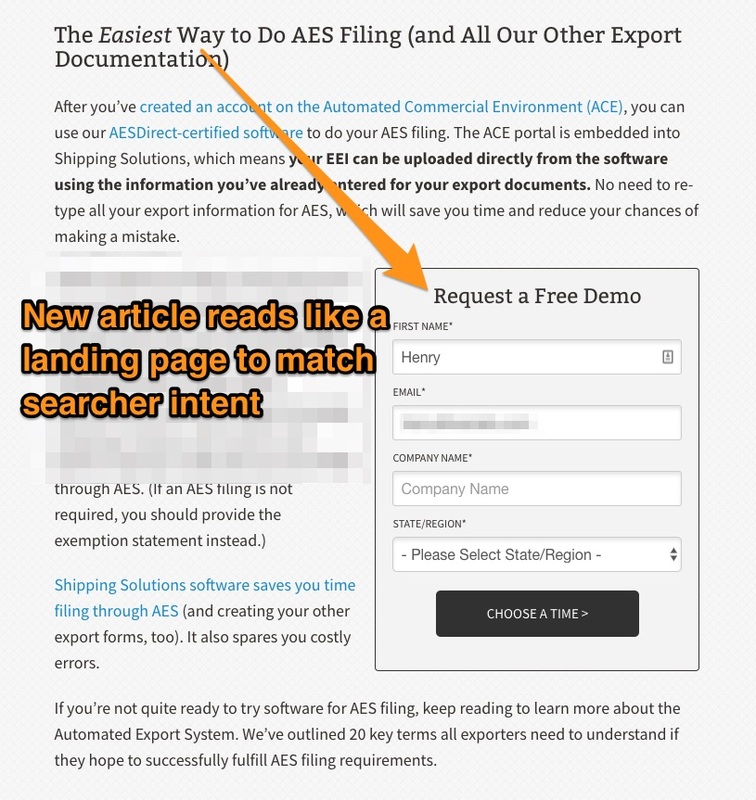 This Shipping Solutions article, originally titled “20 Terms You Need to Know When Filing through AES,” ranked #1 in Google for the term “AES filing.” It had zero free trial requests out of 22,000 all-time page views. We rewrote it as “AES Filing Software by Shipping Solutions (Plus 20 Key Terms),” where it’s currently ranking second in Google for the term "AES filing,” and has three free trial requests out of 2,000 page views. These are small, incremental wins (in this example, about one new bottom of funnel request per month)—but if we can do this easily and quickly for multiple keywords, we're moving our sales opportunities in a big way. If you have articles that are ranking already, you probably wrote them as resources. If you’re already ranking for a bottom-of-funnel keyword, then consider adding a bottom-of-funnel landing page at the top of the article. This addition keeps the existing content that’s ranking, but provides a call-to-action that better matches what the persona is searching. One caveat: You can expect a slight decrease in visits to pages where you’ve employed this inbound marketing technique, but you should find that you’ve increased your bottom-of-funnel leads. 6. Write a pillar page to build authority. They provide support for expanding into new topics. Once you’ve written a reservoir, you can continue to improve your ranking by writing supporting guest posts and regular posts linking within them to the reservoir post. 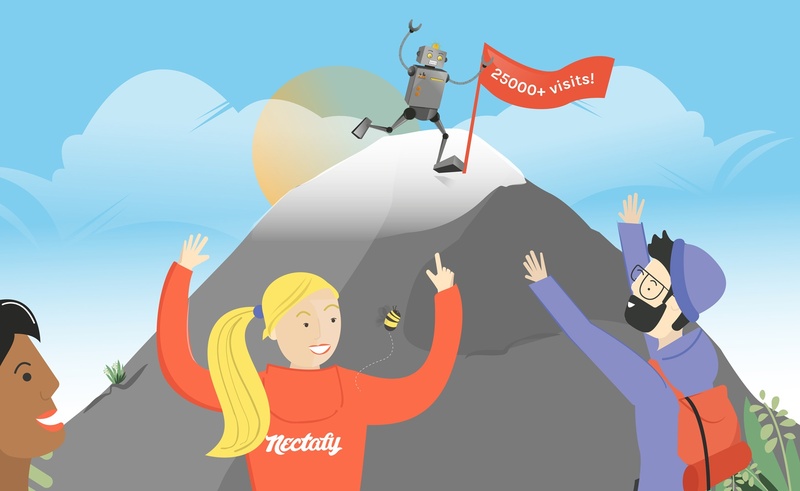 At 25,000+ organic visits per month, your content marketing clearly rocks—by focusing on these tactics that increase conversions, you can get more of those visitors to turn into leads and sales opportunities, which should be your goal.